Dave Mckellar ( Digit3k) has been in the dance world for over 20 years – always soaking in all that there is, always learning new skills and following new DJs, events and genres. Dave has lived in a few great citys, following great nights such as Middlesbrough Club M Tall Trees where it all started properly for him with Paul Taylor playing old school acid house raves. Living at the time with DJs, Dave mastered the basics of DJ’ing, mastering beat matching on vinyl. From there, Dave moved to Bath working in a nightclub called Delfter Krug, where the resident DJ Graham Scullen taught him all there is to know about the digital age – CDJs. With over 7 months of being allowed to use their setup out of hours, Dave practiced every day. Then finally, he got his first ever gig at a club called The Weir Lounge – playing old school house. He quickly becme good friends with resident DJs Graham Scullen and Tom Maddicott where once a month there was a night called Metripolis, where radio 1 recorded an exclusive mix with Annie Mac with resident Tom playing the best underground house. You still listen to that legendary night on youtube to this day. Dave then lived in the small village of Kinlochleven where his obsession grew from all that is house to TECHNO, but he found he was the only guy in the village into this style of music. 2 years ago Dave met the Audiolife crew who have since helped him go so far, including his first gig at Bogbain Farm where he got to play 2 different sets in one night. Since then, Dave has played a few gigs through Clic Sergent charity based events raising money for cancer, which he says has been great fun. Dave also got a breif taste behind the decks at last years Shenanigan, but this year is his Debut. Dave have also played out on Saturo Sounds radio. 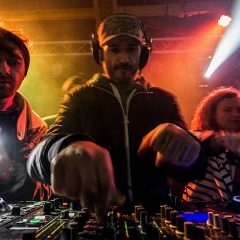 Dave says “Iain Sabiston of Saturo Sounds asked me if I fancied a challenge, asking if I could create a 1 hour mix the day before it was due to go live. I did some research and instead of doing my usual dark techno style I changed it up a bit and chose melodic house/techno – a different style for me but I know Sabistons style and wanted to ensure I blended in a good mix in after his set.